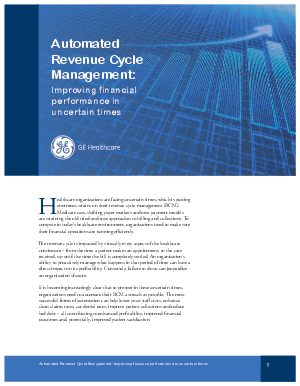 Healthcare organizations are facing uncertain times, which is putting enormous strains on their revenue cycle management. Medicare cuts, shifting payer markets and new payment models are straining the old tried-and-true approaches to billing and collections. To compete in today’s healthcare environment, organizations need to make sure their financial operations are running efficiently. This white paper will show how you can lower your staff costs, enhance clean claims rates, cut denial rates, improve patient collections and reduce bad debt.